A rack-mount beacon receiver intended for teleports and broadcast facilities which require precise satellite beacon signal acquisition and tracking. Embedded with the “SBS2” Series satellite beacon receiver module, this rack-mount version provides reliable operation in any indoor application. The RBR-2150A is a world-class beacon receiver that locks on to, and tracks, CW and modulated BPSK-type beacon signals. 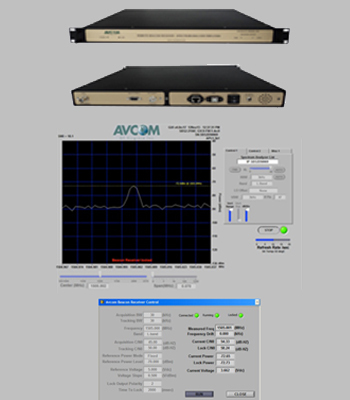 It is monitored and controlled using the Avcom Remote Control Software via serial port, USB, or Ethernet. The Remote Control Software has an intuitive user interface that is easy to use with no special training required. It uniquely offers a Spectrum Analyzer function in addition. The user can switch to spectrum monitoring and signal analysis while the beacon receiver continues to track the locked signal. Features include shape-alarm, signal recording and screen shot capture, SNMP for alarm/monitoring, markers, and Automated Data Acquisition (DAQ) with tolerance comparison, and integrated email alerts. Up to twelve windows can be displayed at one time. The Remote Control Software is available for Windows, Mac, and Linux.